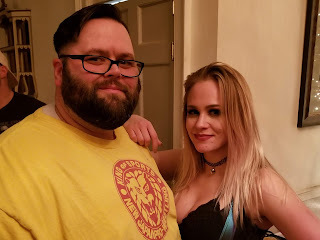 Last Friday, November 30th, I made the drive south to Portland for the final Limitless Wrestling card of 2018 at the Portland Club. 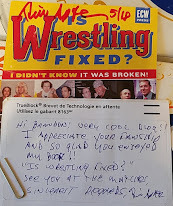 I met Mikey, Roy, Phil, and host of other regulars with a sold out crowd that was itching for a great night of wrestling. When it comes to the Portland Club I'm not a fan of the parking situation or the lighting when it comes to taking pictures with my phone because they just don't come out well. However, everything else about the venue is tremendous! Speaking of photos these fantastic images that you see with this report are courteous of SunnyD Photo, you can find her on Instagram here. 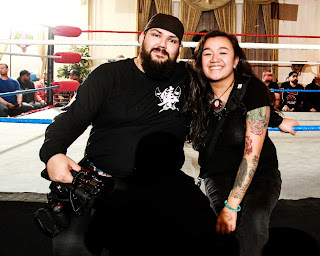 Harry Aaron, who typically is the ringside photographer is now doing videography and he brought in Sunny to take over at ringside. This was her first time and she got some fantastic shots. Once again Limitless opened big with a hell of a match! These two have different styles but they meshed so well. Darby is so athletic and seems willing to do anything in his matches. At one point Darby had jumped on onto the top rope while holding onto Romero who viciously pushed him into one of the columns that was wrapped with Christmas lights. Very hard hitting match that ended with Ace wrecking Darby with a lariat for the pin. 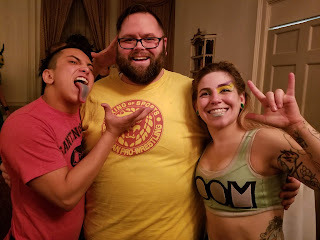 Delilah Doom maker her Limitless debut tonight. Very fast and frenzied match that was fantastic. Crowd was into this from beginning to end and I know I'm not the only one that wants to see Doomfly back in tag competition here in Limitless. Finish came when Doom was isolated in the ring and took a couple high impact moves before getting pinned. Hands down match of the night! Sincerely go out of your way to see this match you will not be disappointed. Greene was dominate most of the match using his size to his advantage. Vox kept battling back and locking on her finisher wearing Greene down. The Hunnies interfered several times through out the match until Vox accidentally took them out with a dive after Greene side stepped her. Vox locked her finisher on for the submission. I loved this match! Crowd was into this big time, they were on there feet and the "tap" chant was deafening! Post match Kris Statlander came out cutting a promo stealing the attention from Vox's victory. I love watching Dickinson in the ring and this match was no different. Dirty Daddy worked the leg th entire match with some loud has hell kicks. Briggs continued to show why he's one of the best up and coming big men in wrestling. Finish came when Dickinson locked in the STF for the surprise submission. DJ Z is replacing the injured Tom Lawlor. I said this in September and I'm going to reiterate it here, I was never impressed with DJ Z in Impact but these last two shows have made me a fan. Really good match, highly entertaining. Ref got bumped and Hathaway threw a gold chain into the ring, Casanova tried to use it but Kevin Blackwood prevented it from happening. DJ Z got the win pinned Casanova when the ref came to. 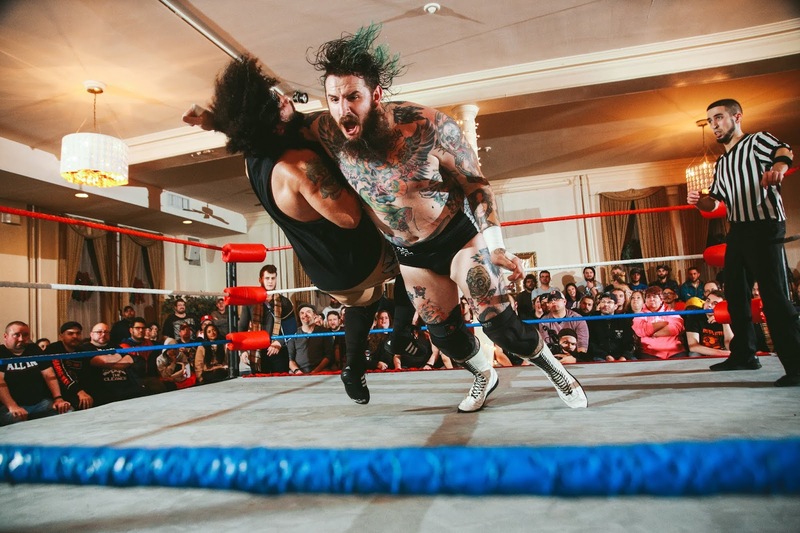 Post match a match was for January was set when Hathaway challenged Blackwood and Harlow to a tag match in January against Casanova and Austin Theory, if Blackwood wins he gets his a rematch with Casanova if he loses then he has to get the Dream Team logo tattooed on his arm. As always these scramble matches are friggin awesome! Puf came out to Mariah Carey's All I Want for Christmas in Christmas themed gear and had the crowd hopping. Match opened with everyone beating on Domino after he cut an arrogant (read hilarious) promo. Eventualy the match broke down to just Brandon Kirk and Bear Bronson in the ring, they both had chairs and sat down in what I thought was going to be them trading shots, instead Kirk got two staple guns and they traded staples to the head. Bronson then took money from referee Kevin Quinn and stapled money to Kirk's head even forcing Quinn to do it. Bronson then powerbombed Kirk on two chairs facing each other. The finish though saw Puf get the pin on Domino and then lead a dance party with Nelson and Bronson. Good match that was back and forth with Statlander squeaking out a win. Post match she jumped by Ashley Vox which set up an unsanctioned matched between the two on January 11th. The Vox vs. Statlander feud has been excellent this year in Limitless and I look forward to the blow off next month. Fun match these six man tags are the best with the lucha rules. Evidently the storyline is that Huckabee treats the ants like crap? I wasn't actually clarified so it felt out of place. Huckabee took the pin for his team. I'm looking forward to the next trio that comes in against MSP. LAX might just be one of the best tag teams around right now. Brody King tore it down in the ring tonight. He moves around in a way a guy his size shouldn't! Match started slow and really built to crescendo where LAX pinned King for the win. What a fantastic night of wrestling! I couldn't have asked for a better distraction for myself after a long week. Can't wait for January 11th!